Imogen Briscoe is one of Data Republic’s brightest up-and-coming data scientists, who has been a valued part of the team for 12 months. After graduating from her Master’s degree in Mathematics, Imogen was looking for a role that would allow her to apply her passion for data and statistics in the real world. 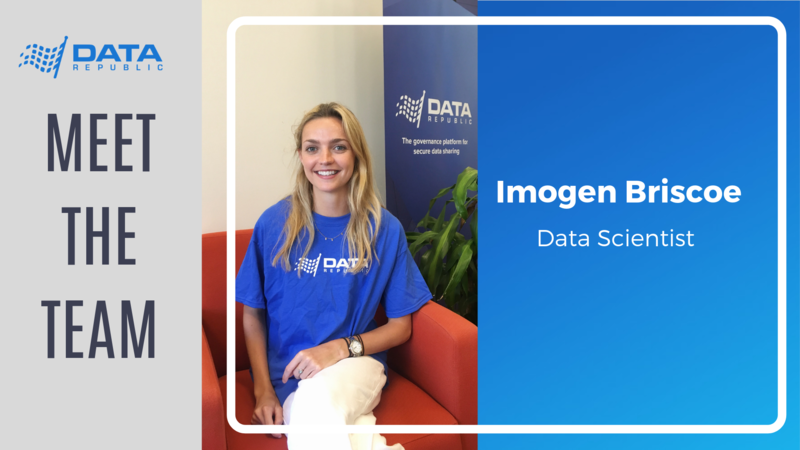 In this ‘meet the team’ blog, we sit down with Imogen (aka Imy) to discuss her transition from university to full-time data science work with the team at Data Republic. Imogen’s position as a Data Scientist at Data Republic sees her support data sharing and analytical projects between major Data Republic customers. Her day-to-day role involves providing support and training to analysts on the Senate platform, assisting with data preparation and governing approved extract requests (SQL, R or Python). Imy is also involved in pre-sales engagement with analyst teams from across the Data Republic ecosystem, here she provides guidance on project timelines, Discovery workpace specifications and approved project use cases for anonymised data exchanged on Senate. Imy says that one of the reasons she chose to work for a smaller company, was for the opportunity to take on more responsibility with projects. However, what made Data Republic stand out to her was the group of highly experienced mentors that she would be working with. Coming out of university, having done a lot of independent mathematics work Imy was looking for a role where she could readily apply these skills in a real-world, business context. Working at Data Republic has pushed her to work collaboratively in a team to deliver tangible business outcomes using data science tools. Working at a startup was a choice that Imy made in order to access the kinds of projects and workspaces described above, however, Imy recognises that the transition from university to full-time work can be a greater challenge if one is not adequately supported in the process. In her time at Data Republic, Imy has been involved in social activities such as the Data Republic bookclub and the JP Morgan running challenge, where she rallied a team together and unlocked a serious new competitive streak for corporate marathons. Beyond this, she describes the DR office banter as a daily mood booster. Want to find a role like Imogen’s? Visit our careers page for current openings. Join the action at Data Republic.